Meaghan McGrath, Research Analyst, Technology Business Research offers insight into the increasingly competitive public Cloud market. Google’s Cloud business, often cited as one of the top-three public Cloud vendors, is evolving quickly and aggressively to catch up to earlier-to-market competitors. At Google Cloud Platform (GCP) NEXT 2016, the company messaged the value that its core competencies in security, data management and machine learning lend to its Cloud services. Analysts believe the value in innovation, when paired with Google’s adaptive Cloud pricing model, elevates its price-to-performance ratio and is helping the tech giant increasingly appeal to the different needs and concerns of enterprise customers, expanding upon its earlier market traction among SMBs and application developers. 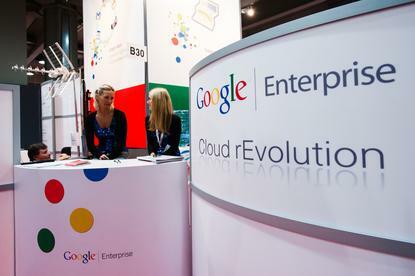 “Two generally disparate parts of Google’s portfolio of businesses, Google Cloud Platform and Google Apps for Work, are now aligned to drive adoption in the enterprise Cloud market,” says Meaghan McGrath, Research Analyst, Technology Business Research. McGrath believes the “knitting together” of Google Cloud Platform and Google Apps for Work culminated at the end of 2015 with the creation of a “cohesive Cloud unit” to be led by Cloud enterprise guru Diane Greene, who joined Google after it acquired her startup Bebop. “The Cloud unit will strengthen each portfolio’s enterprise push while setting the stage for a unified Cloud go-to-market effort,” McGrath says. However, McGrath believes the GCP NEXT event was squarely focused on enhancements and capabilities of the development tools and infrastructure that make up the GCP portfolio. As Google works to change the market perception of its Cloud products, TBR believes there is merit in keeping the portfolios clearly delineated, and only later in their maturity developing integration and extensibility capabilities. During the event, Google educated customers, analysts and partners on the aggressive moves the company’s Cloud business is making to win market share in the competitive public Cloud market, specifically through enterprise appeal. “The hiring of Greene was undeniably a move to help Google better appeal to enterprise customers, leveraging her expertise gained from founding and growing VMware,” McGrath adds. As McGrath explains, Greene has already begun to reform the enterprise go-to-market strategy of the Google Cloud business, focusing on enterprise data security. At the event, Google executives and engineers highlighted innovative technologies and security layers that will help enterprises manage their Cloud environments and ensure their data is more secure than if it were stored on-premises and managed by Google internal security controls, as there are thousands of years of combined engineering personnel experience behind Google Cloud Platform. As a point of differentiation from other Cloud platform vendors, Google is investing heavily in the development of machine-learning capabilities. “Available to developers prior to the event, Google Translate API and Cloud Vision API are pre-trained machine-learning models that can identify languages, translate text strings, and interpret and categorise image content,” McGrath adds. As machine-learning models, McGrath says the APIs continually update themselves through interaction and learning. Google also announced its multilingual Cloud Speech API, a supplement to these predefined models that converts audio to text and is constantly improved through neural network learning, which improves accuracy. “However, while powerful in their pre-configuration and expansiveness of supporting data, these models cannot be based on data specific to enterprise applications,” McGrath adds. “To address this issue, Google also unveiled Cloud Machine Learning (Cloud ML), which allows users to build intelligent applications and predictive models using their own training data and thus return tailored, enterprise-specific results. Only at the beginning of its shift toward serving enterprise needs, McGrath believes Google will continue to improve on the three factors that Greene noted as having initiated traction: better value, reduced risk and access to innovation. “Customers have access to the same infrastructure that underpins all of Google’s businesses, providing customers a fast Cloud with optimised networking and integration,” McGrath adds. McGrath believes the transparency afforded at GCP NEXT 2016, enabling potential customers to see the constant focus on security that permeates Google’s datacentres, will help Google win public Cloud competitive engagements by reducing customer risk. “As these customers expand their usage incrementally and in accordance with workload-specific needs, Google accepts the inevitability of hybrid Cloud deployments, but will undoubtedly innovate to put itself in the most competitive position,” McGrath adds. While datacentre security is an important matter to address, as it will be the linchpin for any Cloud company to win significant market share, McGrath believes Google’s leadership in analytics and deep learning innovation will be key to the company’s long-term differentiation.